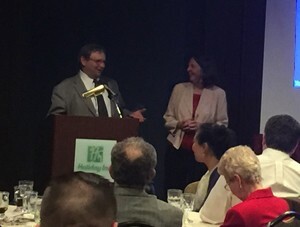 GCPCA Awards Chair Rich Kozlovich surprises Dr. Susan Jones, announcing the award is actually $2,000. The Greater Cleveland Pest Control Association (GCPCA) recently held its annual awards banquet in Independence, Ohio. Dr. Susan Jones, associate professor of entomology for The Ohio State University, Columbus, was the after-dinner speaker. After her in-depth research presentation that focused on studies done on both brown marmorated stink bugs and on bed bugs, Dr. Jones was honored with the annual Tom Evans award, named after the late Pest Management Professional Hall of Famer. The award was supposed to be $1,000 to go toward her research program, but Dr. Jones was surprised and pleased to learn that a few anonymous donors within the GCPCA doubled the amount to $2,000.